Nutritional values do not include the optional toppings. 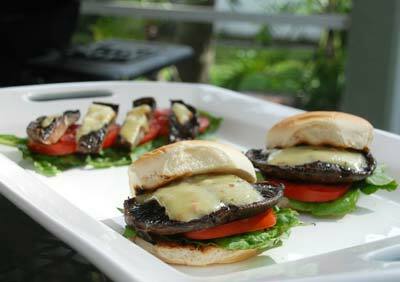 Recipe prepared using low sodium soy sauce, 1 teaspoon hot sauce and a 1 ounce slice of cheese on each burger. Prepare mushrooms by removing stems and wiping caps clean with a damp (not wet) paper towel. Combine soy sauce, olive oil, vinegar, Worcestershire sauce, liquid smoke, garlic, pepper and hot sauce. Place each mushroom in a shallow bowl, gill side up. Pour 1/2 of the marinade over each mushroom, pouring a little in the bottom of the bowl first, to wet the upside down cap, and the remainder into the upturned cap. Marinate for 5 to 10 minutes. Do not marinate longer as the mushrooms will absorb too much marinade. Grill mushrooms on a wood or charcoal fire, or in a hot skillet on the stovetop, or under a broiler. Approximately 2 to 4 minutes per side will usually do, or until the mushrooms are browned and tender. If desired melt a slice of cheese on top during the last minute or so of cooking. Serve on burger buns with toppings of your choice.